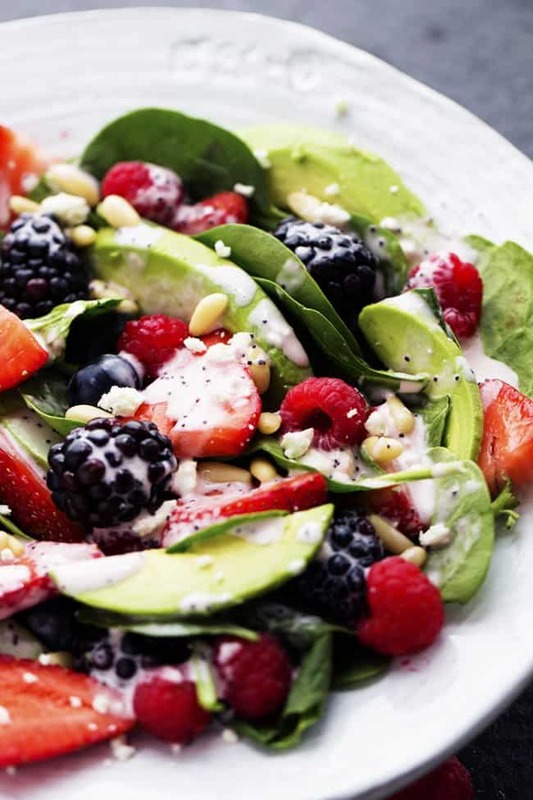 A fresh spinach salad with delicious berries hidden throughout. 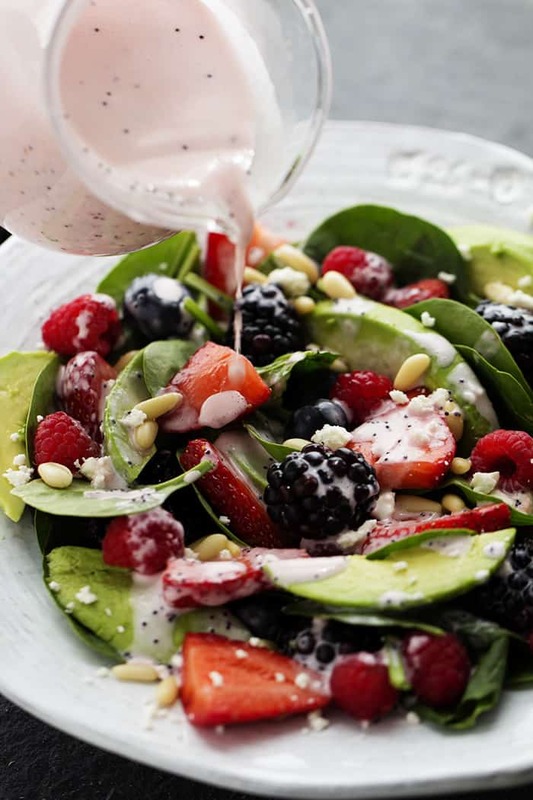 The avocado adds such a delicious and yummy texture and is topped with a creamy raspberry poppyseed dressing! My cute friend from Adie’s Corner came over last week for a visit. Isn’t it so fun to catch up on some girl time and take a time out from your daily routine!? Of course we had to involve food in our girls day and so we made this amazing salad! I always keep my fridge full of delicious fruit. 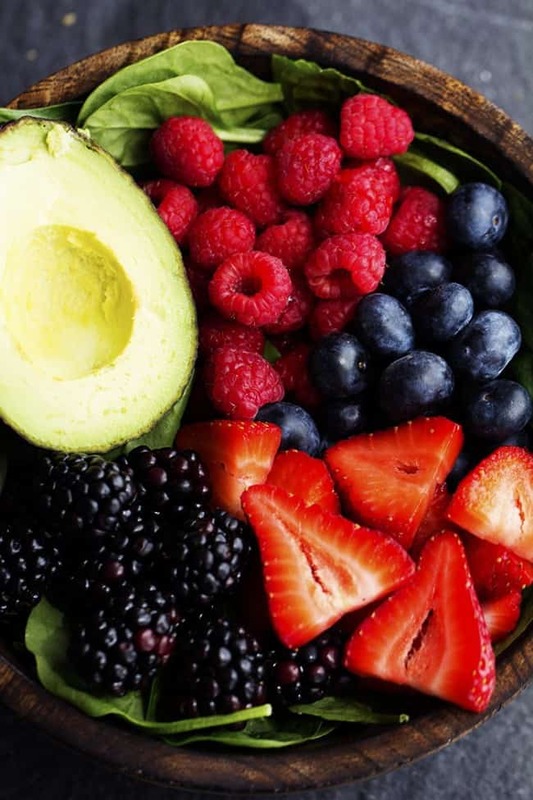 I love fruit in salads. It is the best of both worlds combined. I already had everything ready to go to make this mouthwatering salad. Spinach, berries, pine nuts, and feta cheese. Holy yum. This salad instantly became a favorite. It was absolutely incredible! The fruit is starting to come into season and it is so ripe and fresh. Combine it with some spinach and avocado and the result is amazing! I love topping salads with a sprinkle of feta cheese and pine nuts. Both add such great flavor and the pine nuts add in a new texture. But really. The best part is the creamy raspberry poppyseed dressing on top…. 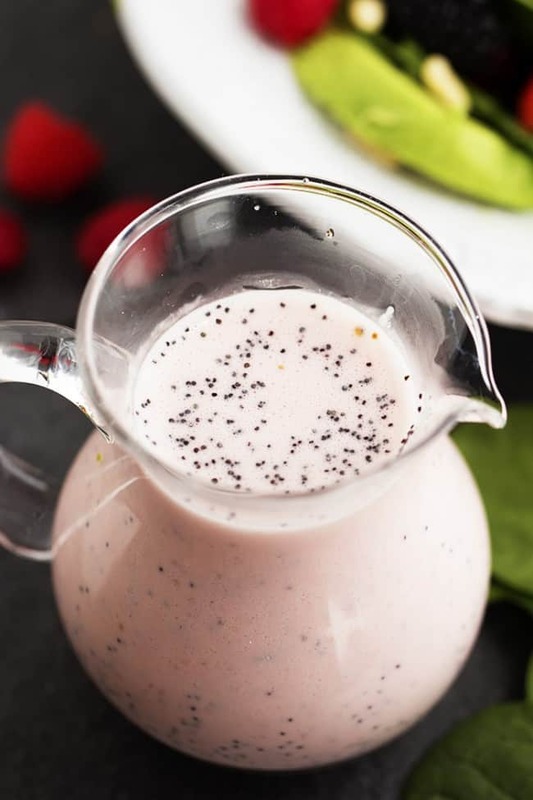 My absolute favorite recipe for creamy poppyseed dressing combines with sweet and ripe fresh raspberries. It is absolutely perfect on top of this salad. This salad was the best. It is perfect for spring and summer and the upcoming warmer months. It will be a huge hit wherever you take it and this flavor is out of this world. It is a gorgeous and delicious salad and I know you guys will love it as much as we did! 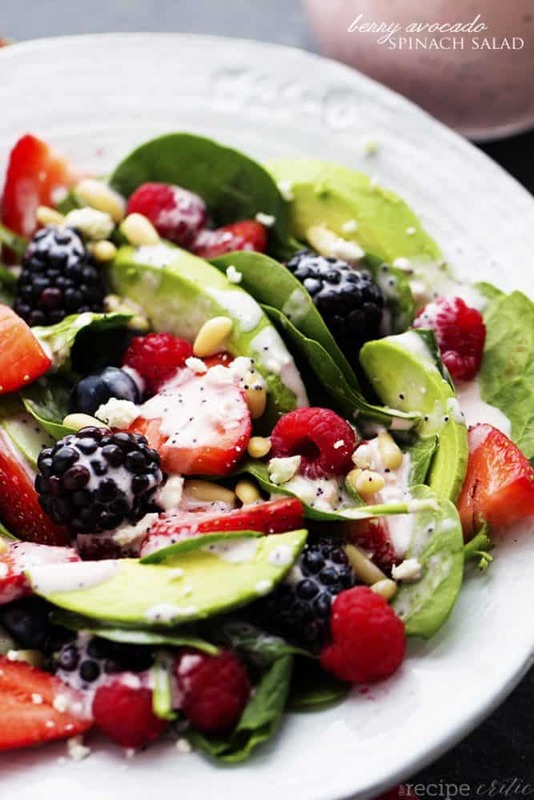 In a large salad bowl, combine spinach, berries, avocados, pine nuts and feta cheese. In a food processor, combine mayonnaise, milk, sugar, cider vinegar, poppyseeds and raspberries. Pulse until blended and smooth. Pour half over the salad and toss to coat. Add more dressing if needed. Serve immediately and garnish with with more feta cheese and pine nuts if desired and enjoy! This salad is everything I love about spring salads! 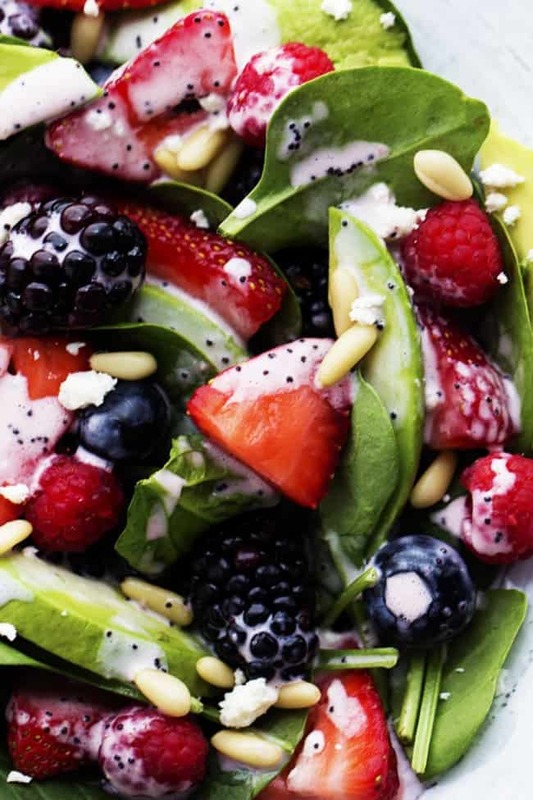 The berries, the avocado, the poppyseed dressing! Pinned! Looks really good! Excellent ingredient combination choices. I made this salad yesterday, and everyone really liked it. I will say that it’s a very sweet dressing – it kind of turns the salad into a dessert, it’s that sweet. I made a doubled version today (to last throughout the week), but reduced the amount of sugar by half – this made it perfect. With half the sugar, the sweetness isn’t overpowering and the tang of the cider vinegar and mayonnaise is more detectable. It’s a lovely salad recipe, thank you!